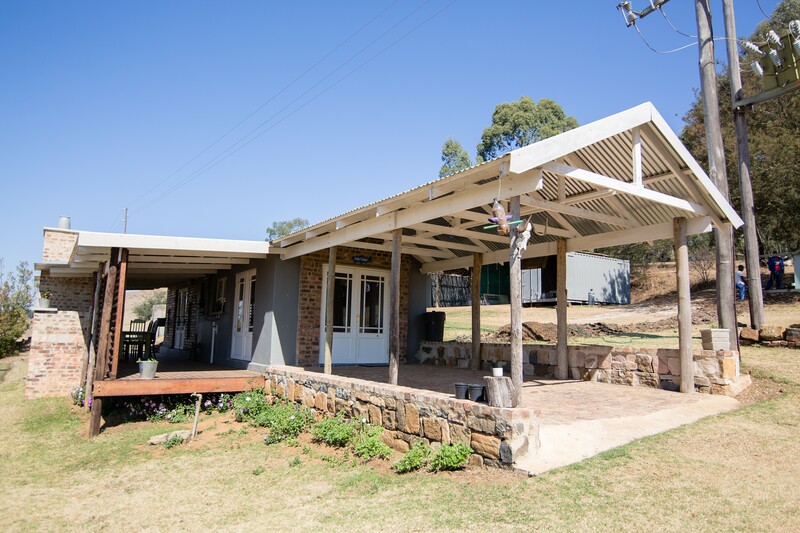 Situated in the Elandskloof Valley, just 19 km from the village of Dullstroom. It is ideally suited for the keen fisherman or a quiet, romantic weekend away and family getaways . Two trophy fishing dams are available and fishing is on a catch and release basis only. San - Solina Cabin - The stone cabin is a two sleeper luxury self - catering. There is an open plan kitchen /lounge and eating area. The country kitchen is fully equipped and also has a coffee machine. 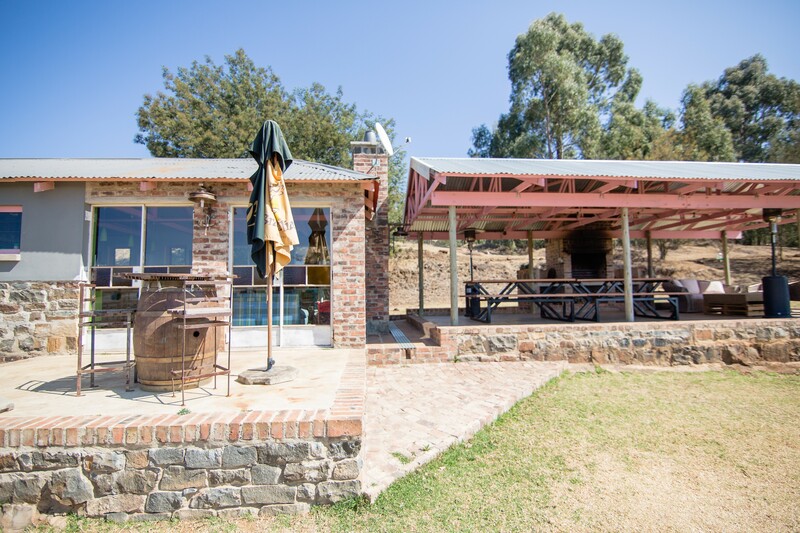 There is a large leather couch, small round dining table, fireplace and Dstv with all the doors opening out onto the large surround patio having table chairs & umbrella , a webber & barrel braai and overlooks Lake Heron dam. Parking is alongside a under a covered carport. There are two bedrooms (main only with a jet master fireplace & doors opening out onto a private garden area - which is pet friendly) have Kingsize beds which singles can be requested, & have under heater blankets. An additional double - bunk bed in the passage el - cove, caters for two children under 12 yrs old. There is an open plan kitchen /lounge /eating area. The country kitchen is fully equipped, and also has a coffee , ice making & dish washing machine, micro wave, under counter oven & gas hob. The breakfast counter seats 6 with couches & chairs in the lounge for watching Dstv in front of an open fire. Doors open out onto a morning patio with seating & umbrella and to the boma area. Is our smaller cosy 2 sleeper cottage. There is an open plan kitchen /lounge and eating area. The country kitchen is fully equipped. There is a 2 seater couch, and a breakfast nook, Queen Ann fireplace and Dstv with all the doors opening out onto the large covered wooden deck with a build in braai. Parking is under a covered carport. The bedroom doors opening out onto the wooden deck and have Kingsize beds which singles can be requested, & have under heater blankets. 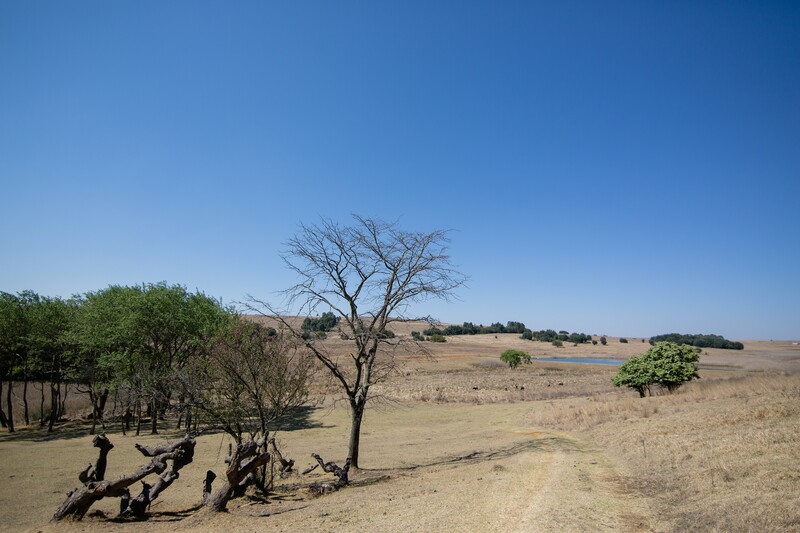 Fly fishing is available at the bottom dam Lake Heron (2ha) with Lake Troy (3ha) a further 500m away on the other side of the old farm house & new cottage. All angling is catch and release only, with fly tackle and barbless hooks. There is a small rowing boat, basic rod and reel, & C/R net, available for your use at each cottage. The dams are stocked with rainbow , brown trout . Other activities are clay pigeon shooting & hunting. 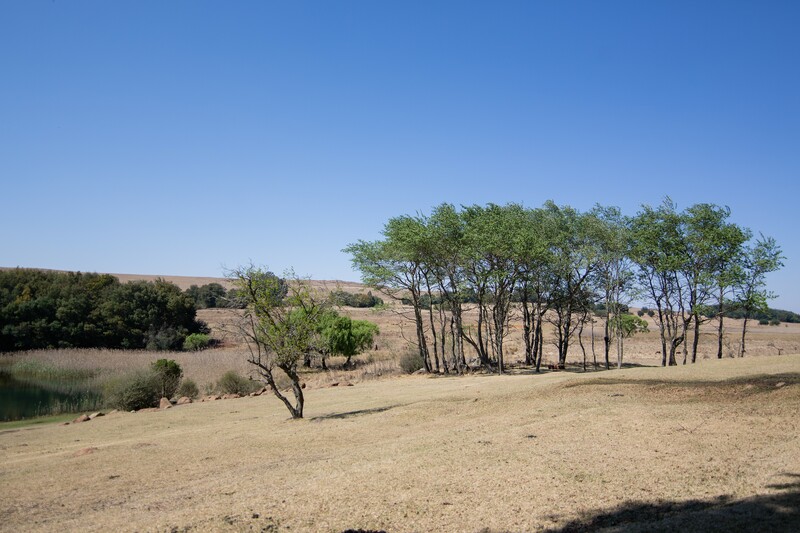 We have a clay pigeon shooting range on the farm, a CTSASA registered service provider . Our hunting activities include, wingshooting, the famous triple McNabb hunt & hunts on indigenous species of game during the hunting seasons. We have a 120 seater Wedding & Function center for groups - full catering to suit your needs available on request. Maximum of 2 dogs per cottage! 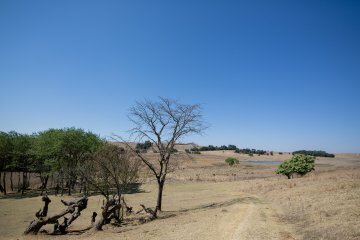 PLEASE NOTE: No swimming is permitted in any of the dams. Consideration must be given to resident dogs, cats, horses, farm animals & wildlife. Dogs must be leashed when around the other cottages, guests and staff on the farm, but can run freely elsewhere under strict supervision by their owners. ONLY ONE OF THE UNITS, Starry Krowa , IS PET FRIENDLY for large breed dogs. The other 2 units on Lake Heron Game and Trout Farm are strictly SMALL DOGS ONLY . NOTE that owners are fully responsible for their pets and any damages caused by pets must be paid by the owner prior to departure. Please be considerate pet owners, pick up and dispose of pet waste and keep pet noise levels to a minimum, considering other guests on the farm.